AMD’s Radeon RX 590 has been rumored for quite a while, and with PowerColor having posted a page that reveals the release date to be November 15, it seems very likely that we’re soon to be greeted by the new Radeon. In its press release, PowerColor says the RX 590 offers a 10% boost over competing products of the same price, and better still: it’s said to be 17% faster than the RX 580. If you’re alarmed that the RX 590 Red Devil looks like the RX 580 version to come before it, you probably shouldn’t be. Assuming PowerColor doesn’t lie about specs as much as it leaks them, the RX 590 is a clock-boosted RX 580 – but it’s one heck of a clock boost. Still, +17% over RX 580 seems lofty. I can’t confirm or deny whether we have an RX 590 in the lab which has already been benchmarked at three resolutions, because I’m not a Taiwanese manufacturer that fails to respect embargoes. Should the card actually exist, we’ll hopefully have some benchmarks ready for you. RX 590 2304 1576 ~7.2 TFLOPS 8 GB 3 256 GB/s ~225 W $??? With the same number of cores, but a much higher clock speed, the RX 590 should be spec’d around ~7.2 TFLOPS, which, not surprisingly, about matches PowerColor’s touted 17% improvement. Like the RX 580, the 590 looks to offer the same memory configuration of 8GB GDDR5, and likewise offers 256 GB/s of memory bandwidth. The only thing we don’t seem to know about the RX 590 at this point is what it’s going to cost, and not to mention, what its overclocking capabilities will be like. The card is already clocked quite high, but the Polaris architecture more complementary towards OCing than Vega is. 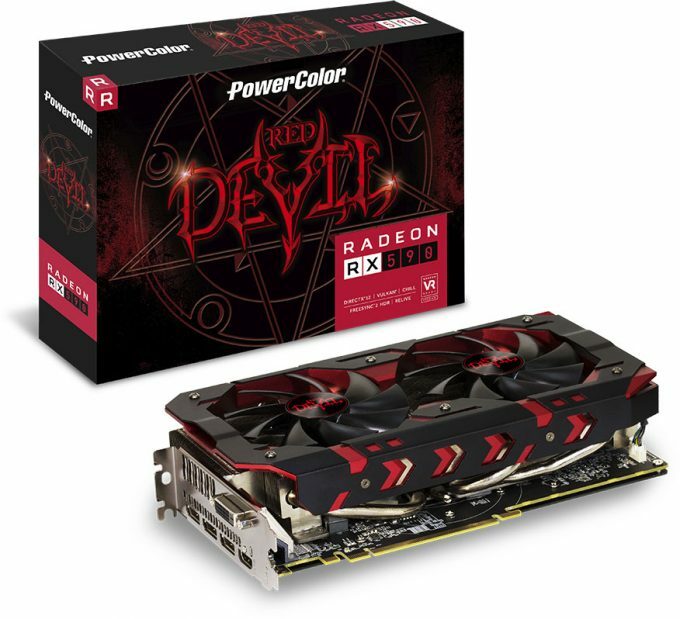 The RX 590 itself isn’t the only thing that’s interesting to me here, but also the fact that PowerColor’s card includes a game bundle with some very alluring upcoming titles. Those include Resident Evil 2, Devil May Cry 5, and The Division 2… as in, all three are included. That’s a $180 value, and a sweet bonus for those who actually need to buy a new mid-range graphics card. Seriously – it’s one thing to get a single title included, but three AAA titles highlights some real aggressiveness from the AMD side – assuming this bundle isn’t exclusive to PowerColor. It’s just, none of those games are out yet, and won’t be until the new year, which somewhat dampens the mood.